Iranian officials are claiming that U.S. authorities treating the reporter "inhumanely and condescendingly with no reason amounts to typical behavior of an apartheid regime against its non-white citizens," according to reports in Iran's state-controlled press. "The Islamic Republic of Iran officially calls for Mrs. Hashemi to be entitled of her basic human rights," the statement read. "It is a pity that she was not allowed to have any contact with outside worlds for two days, while she had traveled to the U.S. to pay a visit to her family," Iranian officials claimed. Iranian officials took shots at President Donald Trump, chiding his treatment of the international and domestic press. Media outlets across the nation have lamented what they claim is the Trump administration's unfair treatment of the press. 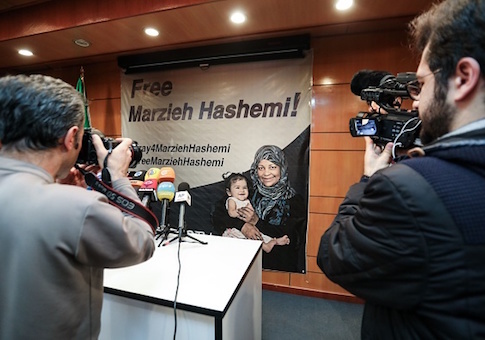 "Unfortunately, the way the American government agents have treated her is a blatant violation of human and citizen rights and also infringes the basic rights for a Muslim woman," read the statement from Iran's foreign ministry. "These kinds of behaviors show that the American government holds no respect for the principles it abuses for censuring its critics." "Unfortunately," the statement continued, "the U.S. has turned into a dangerous land for journalists." Multiple requests for comment to the relevant agencies were declined. The State Department referred a Free Beacon reporter to the Department of Homeland Security, which declined to provide information of the matter. A separate request for comment to the FBI also was declined. "We do not have any comment," and FBI spokesperson told the Free Beacon, adding that no information about the alleged detainment has been released.